With this cheat sheet, you'll find yourself comfortably cruising along in Blender. Just about every key and key combination can access a feature in Blender. This cheat sheet doesn't list every single one of those, that's been done. 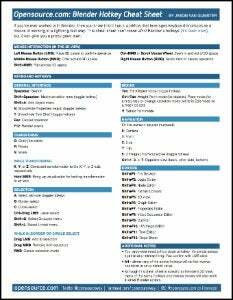 Instead, this cheat sheet focuses on the most commonly and frequently used hotkeys and mouse button presses. If you get these down, you'll find yourself comfortably cruising along in Blender, way faster than clicking through a bunch of menus and submenus.